together committed to serve the Kingdom of God. of the renewal of the Gospel in our environments of life. Jesus Christ is our only treasure. It is He our polar star our satellite Navigator. We are consecrated secular, daughters of St. Angela Merici, also called Secular ursulines because St. Angela has dedicated her Company to St. Ursula. We live our total consecration to God in poverty, chastity and Obedience, in the everyday service with the people we meet, in the different social and ecclesial realities. We are in the world but not of the world, participating in the active life uniting action with contemplation, acting in such a way as a ladder between earth and heaven. We commit ourselves for a wise discernment of the lights and darkness present in the world and in history to make room for the plan of God for it. We work together with so many brothers and sisters to favour fraternal relationships in our living and working environment capable of making human beings open themselves to God. We try to live a life style of peace and concord which characterised our Foundress. 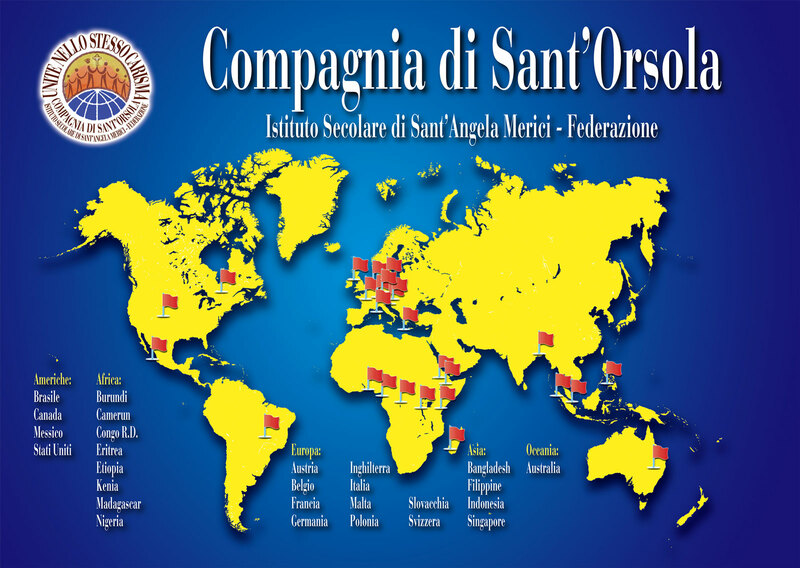 We are organized in diocesan and interdiocesan Companies united in the Federation Company of St. Ursula Secular Institute of St. Angela Merici.